There are 2 Westin hotels in the Galleria Mall. 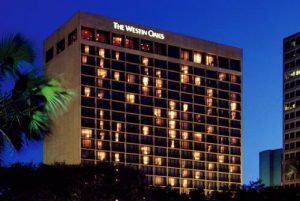 Our seminar location is at the Westin Oaks. This course is especially designed for ultrasound professionals with little or no formal physics background. It includes specific preparation for the SICQ questions on the SPI exam. By simply attending this class, you satisfy all prerequisites to challenge the ARDMS SPI Physics exam. This fetal echo program is aimed at the echocardiographer seeking registry preparation and/or continuing medical education in this specialty area. You will receive a comprehensive course outline, which complements the numerous video loops and still images of normal and abnormal fetal cardiac anatomy. At this time, we are devoting all of our efforts to provide the very best seminar possible. Therefore, online Fetal Echocardiography X-Zone questions are not available. Thank you. This program is specifically designed for sonographers and mammographers seeking a comprehensive, yet efficient, review and registry preparation in breast sonography. Students will be presented a variety of educational tools, including extensive audiovisuals, a comprehensive workbook, image review, and close personal interaction. A block of rooms have been reserved for us at special seminar rate of $139 for a single and $154 for a double. Make hotel reservations early and be sure to mention that you are with ESP Ultrasound. Super Shuttle – (800) 258-3826 Bush Intercontinental Airport is $30 one-way, $58 round-trip. Hobby Airport is $21 one-way, $45 round-trip. Taxi services are preferred for parties of three or more. Travel from Bush Intercontinental Airport is approximately $80 one-way, and Hobby Airport is approximately $50 oneway. We have provided driving directions as a guide. Please call hotel or click the here for current and accurate driving directions. Take Interstate 10 East to Loop 610 South and exit at San Felipe/Westheimer. Turn right onto Westheimer. The Galleria Mall and the hotel are directly on the left. Take Interstate 45 South to Loop 610 West. Loop 610 West becomes Loop 610 South. Exit right at Westheimer, proceed 1 block, and turn left onto South Post Oak. Public parking is available in the underground garage. Take Highway 59 North to Loop 610 North. Exit at Westheimer and turn left. The Galleria Mall and the hotel are on the left. Free self-parking, in the blue garage, directly under the hotel and attached to the mall. Valet is available for a fee. Complementary internet in lobby area. Health club, business center, and outdoor swimming pool. Hotel located in the exclusive Galleria shopping mall.